"A scream on a surface through form and through style." Initially an artistic and literary doctrine of political censorship in the Soviet Union. 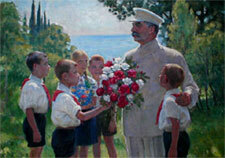 Established by the Union of Soviet Writers as a compulsory practice in 1932, Socialist Realism mainly dictated that artists portray a positive depiction of socialist society in conventionally realistic terms. 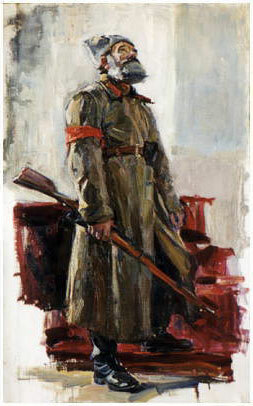 After Stalin's death the practice of Socialist Realism opened tremendously (compare stalin-era paintings with post-stalin paintings in the gallery), and censorship gradually relaxed throughout the following decades (while censorship in the U.S. had gradually begun to fail in the 1960s, Soviet censorship remained comparatively strong until glasnost was enacted in the mid-1980s). The most famous definition for socialist realism is Aleksandr Gerasimov's explaination: "Realistic in form, Socialist in content." Maxim Gorky had earlier summarized that Socialist Realism employs theory to portray the importance of social activity in shaping humans. Socialist Realism is primarily optimistic about life, Gorky explained, and is cognisent of the educational role of art, whether potraying information through images, sounds or text. Strikingly different in environment from Socialist Realism, the Mexican Muralists portray capitalist society, and the oppression of the working class within it. Both forms of art recognise the educational role of art, and the Mexican Muralists put this into practice by painting enourmous murals on the most public of buildings in order to reach and communicate effectively to the largest possible audience. 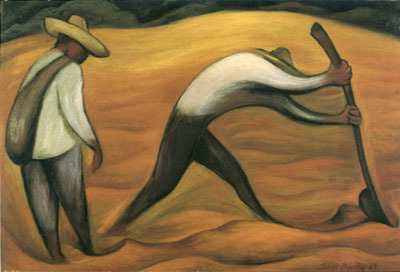 One strong addition in the style of the Mexican Muralists is portraying not only the importance of social activity (which it does on a much more grandiose scale), but making abundently clear the importance of material conditions, making for a more rounded practice of theoretical marxism; i.e. historical materialism. Both forms of art see the future as full of hope and optimism, they contrast however in thier outlook on the present. The Socialist Realists, in painting about socialist life, are usually optimistic, while the Muralists who portray life under capitalism, paint primarily very bleak and heartbreaking works – as Sergi Eisenstein said of the paintings of Jose Clemente Orozco: "... the nerve of reality is fixed as though with a nail to the wall." 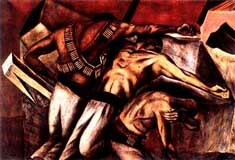 José Clemente Orozco and Diego Rivera: The Murals An essay explaining the differences between the two great muralists. Please mail any questions, suggestions, and additions to Brian Baggins.